Jingle All the Way is a good example of a shoddy Christmas movie. Both the story and the message are wildly inconsistent—as frenetic as holiday shopping at the mall and as insincere as many a Christmas advertisement found there. As the formula goes, busy businessman Howard Langston (Schwarzenegger) is a neglectful father. He hopes to make things up to his son Jamie (Jake Lloyd) by getting him the one toy every child wants this Christmas: a Turbo-Man action figure (Schwarzenegger humorously calls it a doll throughout). Howard also promised his wife Liz (Rita Wilson) he would buy the action figure months ago, so his desire to make his son happy is at conflict with his desire to cover up his mistake from the get-go. 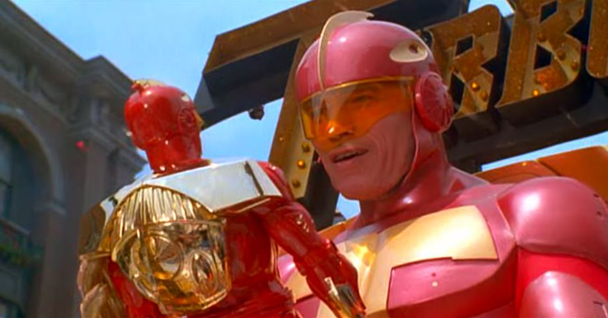 Of course, it’s Christmas Eve, so he’ll be hard-pressed to find a Turbo-Man. At times the movie seems to believe it’s a critique of the excessive commercialization of Christmas, but the movie never really understands that its own superficial handling of the theme makes it instead a product of that very commercialism. It’s become something of a cliché to include casual complaints about commercialism and materialism in holiday narratives while still largely embodying those values. A Charlie Brown Christmas (1965) actually tapped into the sadness of commercialism, and countered it with a clear message arguing for the true meaning of Christmas. For all its flaws, Hook (1991) is good at criticizing a father who isn’t there for his kids. Jingle All the Way satirizes holiday commercialism only to add a dose of lunacy to the shopping scenes, and genuinely avoids any serious (i.e. not tagged-on) critique of a workaholic father who thinks buying the perfect gift for his son is what Christmas and family are all about. The narrative and characters are similarly inconsistent. In one bizarre scene, Howard punches his neighbour’s reindeer out, only to share beers with the animal afterwards, which apparently makes things better. A mailman named Myron (Sinbad) competes with Howard in his search for a Turbo-Man action figure, but Myron switches from friendly rival to crazy sidekick to villain throughout the movie, even threatening the police with a homemade bomb at one point. Around the time that Howard should be learning that the gift doesn’t make Christmas, the film veers into kiddie adventure territory, with Howard flying around in a Turbo-Man costume and jetpack (yes, a real jetpack! ), with Jamie in peril. In the end, even though Jamie is almost killed by Myron, the boy is still touched by Myron’s dedication to his son and does “the right thing,” giving Myron the Turbo-Man action figure he has just won. That’s like pardoning some Black Friday jackass who stabs someone for a PlayStation 4 because they wanted it for their kids. If you want hilarious, genuinely-biting holiday madness, watch Christmas Vacation (1989). Of course, the easy defence is that this film is “just entertainment,” meant to make you laugh, or the family smile together, or at least to distract the kids so you can work on the big holiday dinner undisturbed. Yes, Schwarzenegger’s delivery is (as always) amusing, and Phil Hartman’s smarmy neighbour is enjoyable, but the bulk of this movie is garbage—neither good simple fun nor amusing lunacy. At one point in the film, a mall Santa and bootlegger try to sell Howard a shoddy knockoff of Turbo-Man. The toy speaks a different language and parts fall off when Howard opens the package to check it out. Disgusted, Howard asks for his money back, since he knows his kid can tell the difference between quality and crap. If you’re a parent, so do you, so don’t put this movie on for the kids. They deserve better. And there’s plenty of better out there. Directed by Brian Levant; written by Randy Kornfield; starring Arnold Schwarzenegger, Sinbad, Phil Hartman, Rita Wilson, Robert Confrad, James Belushi, and Jake Lloyd.